My family of 4 stayed in Aldea Thai unit 233. It had two bedrooms (1King/2 full beds) and 2 bathrooms. It also had tow murphy beds in the living room we did not use. The unit itself was clean and functioned well. The kitchen sink leaked a little and things were slightly aged throughout the condo, but nothing that took away from the trip. The terrace is nice, but is on the North side of the building, so very limited sun. There is also construction going on on the surrounding properties, so when you are outside, you are looking at the construction workers next door. Also you are right on the main street to Mamitas beach, so the restaurants below and around you are quite loud. However when inside the unit you can not hear them. One annoyance was a water pump in the unit above this one was extrmemely lound and made sleeping difficult. I asked the property management company (playa moments)to fix it, but they were unable to. Small frustration, but annoying on vacation. Overall great location and functional place to stay. Problems with getting in to the apartment as well as an unprofessional Concierge service, is still what i Remember. The facility itself was fine, though the Private pool was not clean and the area surrounding this was not ok (rotten tree and terrace broken). Besides that I could wish that Aldea Thai was somewhat more concerned about their primary pool, where we saw this at times as more a bar than a pool - with people smoking and drinking EVERYWHERE in the pool. Great place, great staff and attention! We booked this place as gateaway from the city and we could not made a better choice. the unit gaven was pretty amazing with all we needed to have a great experience as we do! At the moment there is a construction right in front of Aldea thai, nothing special for those who do not care about it! Thank you Erick for your attention while there and to Luna too who gave us an excellent attention and helped us with precious info before arrive there.This was the best place ever!We'll be back soon! I wanted to provide a first hand update on this building overall and more importantly, the property manager that I worked with. I see all of the negative reviews on this website and there is a flaw in the Tripadvisor system because Aldea Thai is NOT managed by one administrator. There are actually more than 15 different property administrators that are represented within this building and your experience and the quality of your residence will be significantly impacted by whomever you decide to work with. Do NOT look at Tripadvisor and assume that the details provided by past guests are applicable to your property management company and/or residence unless you confirm unit numbers and the name of the management company. I stayed and elected to book with a the largest administrator named Playa Moments. The staff is very well trained, professional and courteous. They are also bi-lingual. They took a deposit on my credit card and then we were off to the residence. On the way, I was familiarized with all of the amenities of the property. The residence I stayed in was a 2 bedroom/2.5 bathroom penthouse unit. It was very spacious and had a fully equipped kitchen. I also opted to have my refrigerator stocked and it was all 100% accurate upon my arrival. The bedrooms are decent sized and the unit was laid out nicely. Terrace and private pool are amazing. I was given all of the information that I needed related to the residence and the property management. They had the housekeeping pre-scheduled at a time that I requested and they did a very good job. Overall, I would say it is comparable to a true hotel operation. The location of Aldea Thai is ideal. 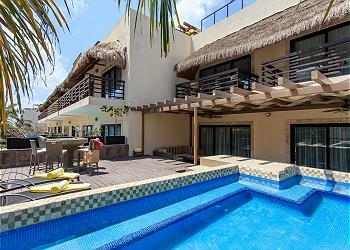 You are literally across the street from the best beach and beach clubs in Playa del Carmen (Mamitas and Kool). You have more than 10 restaurant choices within 1 block of the project. You are located almost in the center of La Quinta (5th Avenue). Thank you! Our stay at 2233 Aldea Thai was everything that we could have expected. The pictures that were displayed on the website were exactly what we got, a very well decorated condo with lots of room for my family of 4. Eric our personal staff from Playa Moments was the reason the stay was so amazing. There were a few things that we required in the condo in the kitchen and he made sure these were brought to our condo immediately. His attention to detail was amazing. The only thing that was not great was looking at the construction of two condos on either side of us but really, it did not change our stay and that is life, people build things. Go stay here, you will write your own memories and I will guarantee you that with the location and Playa Moments you will have the time of your life. Hi John, it was a pleasure to have you and you beautiful family with us. We are always happy to provide our guest with everything they might need to make their stay more comfortable and on a timely manner. Playa del Carmen is a constat grwing town, there are constructions everywhere unfortunately we have no control over this; We are really happy to hear you had a wonderful time with us and We hope that we get the opportunity to welcome you back soon. Kind regards from the Playa Moments team! Amazing place with Private Pool! Aldea Thia is the perfect place to stay at just less than a 2 min walk to the best beach clubs in town, the condominium is beautiful and the shared pool is huge it even counts with a bar! The apartment was spectacular best night sleep with the softest sheets, wifi was on point, the place had a gym and valet parking. Our apartment counted with its own private pool which was pretty big to our surprise, in general the apartment was big, spacious and had everything we need for a perfect stay. Staff was always very polite and helpful, we were able to set up a couple of tours with them and they always helped us solve everything in a timely manner. We travel often and always stay in condo rentals, this was by far the best service that we have experience in our time traveling, we can’t wait to come back! We rented a 2 bedroom 2 bath condo from and could not have asked for a better experience. Every request was granted immediately. The condo was clean, large and the kitchen was well equipped. The private expansive terrace, pool, hot tub, bar, wet bar, swim up bar, outdoor dining area, outdoor lounging area and outdoor shower.were to die for. The common pool is nice and the proximity to the action on 5th Avenue and the beach can't be beat. Thank you for your evaluation and kind comments. It was a pleasure to have you with us, we certainly hope we get the opportunity to welcome you back soon. Kind regards from the Playa Moments team!